IBM (IBM) has butted heads with Apple (AAPL) in the past, but this time it's personal. 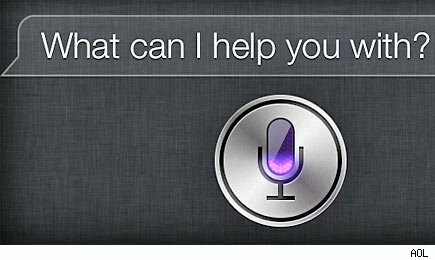 Big Blue is asking employees to refrain from using Siri -- Apple's ballyhooed digital assistant -- while at work. This may seem like an odd request at first. IBM isn't Microsoft (MSFT), a company with such deep-rooted hatred for all things Apple that CEO Steve Ballmer reportedly mocked an employee for trying to take his picture at a company meeting with an iPhone three years ago. IBM doesn't mind if you bring your iPhone to work. Just don't hold down the smartphone's home button long enough to awaken Siri from slumber. Wedged into the iPhone Software License Agreement, Apple warns that "when you use Siri or Dictation, the things you say will be recorded and sent to Apple in order to convert what you say into text." As Wired magazine points out, the users are agreeing and consenting to letting the company use the voice input and user data to improve the products -- as well as Apple's other products and services. Is it any wonder why IBM is asking employees not to use Siri while they're at work? The last thing the tech giant wants is someone to use Siri at a time when someone else at the company may be discussing an upcoming IBM product or making a business decision. Wired also points out that American Civil Liberties Union put out a warning for Siri users two months ago. "Where is the nearest abortion clinic?" is an extreme example that the ACLU brings up in making the point that consumers need to be careful. Everything that they say to Siri is apparently going to a server farm in North Carolina. The ACLU offered a way out two months ago. iPhone owners can go into their phone's "settings" tab, tap "general," and then Siri. Sliding the Siri option to "off" results in Apple deleting the user data and any recent vocal recordings. Apple may still keep older recordings, but only after they have been "disassociated" -- or not connected to the -- identifiable user data. So the next time you see Apple's ad starring Samuel L. Jackson preparing for dinner at home with Siri's assistance, know that the night's details are going somewhere. Bigger iPhone Screen, Bigger Apple Profits? When criminals hack a Facebook account, they typically use one of several available "brute force" tools, says Grayson Milbourne, Webroot's manager of threat research for North America. These tools cycle through a common password dictionary, and try commonly used names and dates, targeting hundreds of thousands of different email IDs. Once hacked, an account can be used as a platform to deliver spam, or -- more commonly -- sold. Clandestine hacker forums are crawling with ads offering Facebook account IDs and passwords in exchange for money. In the cyber world, information is a valuable thing. Commandeering occurs when a criminal logs on to someone else's account using an illegally obtained ID and password. Once online, they have the victim's entire friend list at their disposal and a trusted cyber-identity. The impostor can then run a variety of confidence schemes, such as the popular "London scam," in which the "friend" claims to be stranded overseas and in need of money to make it home. The London scam has a far higher success rate on Facebook -- and specifically on commandeered accounts -- because there is a baseline of trust between users and those on their friends lists. Profile cloning is the act of using unprotected images and information to create a Facebook account with the same name and details of an existing user. The cloner then sends friend requests to all of the victim's contacts, who will likely accept them, as they appear to be from someone they know. Those accepted friend requests give the con artist access to his new "friends'" personal information, which can be used to clone other profiles or to commit fraud. As Grayson Milbourne puts it, "Exploiting a person's account and posturing as that person is just another clever mechanism to use to extract information." Perhaps what's scariest about this kind of crime is its simplicity. Hacking acumen is unnecessary to clone a profile; the criminal simply needs a Facebook account. Cross-platform profile cloning is when a cyber criminal obtains information and images from Facebook and uses them to create false profiles on another social-networking site, or vice versa. Because the profile is often cloned to a social networking platform that the victim doesn't use, this kind of fraud may also take longer to notice and remedy. Phishing on Facebook usually involves a hacker posing as a familiar individual or respectable organization, and asking for a user's personal data, usually via a wall post or direct message. Often, users will be directed to click on a link. Once they do so, their computer may be infected with malware, or they may be directed to a website that offers a compelling reason to divulge sensitive information. A classic example would be a site that congratulates its victims for having won $1,000 and prompts them to fill out a form to collect their prize -- a form that requests credit card, bank account or Social Security numbers, which can then be used by the fraudsters. Also becoming increasing common, warns Milbourne: "spearphishing," a practice that uses the same basic idea but targets users through their individual interests. In this common con, the scammers direct users via some sort of clickable enticement to a convincing, but spurious, Facebook log-in page. When the victims enter their usernames and passwords, they are collected in a database, to be used by the original scammer or resold to other criminals. Once scammers have a user's login information, they can take advantage of the identity through apps like Facebook Marketplace. Posing as a reputable user lets the scammer capitalize on the trust that his victim has earned to sell fake goods and services, or promote brands they have been paid to advertise. In affinity fraud, con artists assume the identities of people in order to exploit the trust of those close to them to steal money or information. Facebook facilitates this type of fraud because people on the social network often end up having a number of "friends" they actually do not know personally and yet implicitly trust. Criminals can infiltrate a person's group of friends and then offer someone deals or investments that are part of a con. They can also assume an identity by hacking into a person's account and asking their friends to wire them money, or give them sensitive information like a Social Security or credit card number. Few sites provide an easier source of basic personal information than Facebook. While it is possible to keep all personal information on Facebook private, users frequently reveal their email addresses, phone numbers, addresses, birth dates and other pieces of private data. As security experts and hackers know, this kind of information often finds its way into passwords or answers to "secret" security questions. While the majority of unprotected information is mined for targeted advertising, it can be a used for more pernicious ends such as profile cloning and, ultimately, identity theft. Most mass email advertisements are legal, if annoying. However, the growth of social networking has allowed for a new kind of spam called clickjacking. Clickjacking uses an advertisement for a viral video or article as an inducement to click on a link. Once clicked, the link sends the user to a page that tricks them into taking actions that they don't realize they are doing, such as sending an advertisement to all their friends' walls, buying an item via a concealed page, or revealing personal data. This has become such an issue for Facebook that earlier this year, the company teamed up with the U.S. Attorney General to try to combat the problem. Motley Fool contributor Rick Munarriz does not own shares in any of the stocks in this article. The Motley Fool owns shares of International Business Machines, Microsoft and Apple. Motley Fool newsletter services have recommended buying shares of Apple and Microsoft, and creating bull call spread positions in Apple and Microsoft.